"Alright fam dis iz da ride dat kill'd ppl fam uno M8?" "Ya see fam, last week it got n' crashed on the loop M8 and ppl fell out of d' seatbelt thing n' died"
So I said to them "It didn't crash and no one died on it. It just-"
Then I was interrupted by one that said "Yeah it did ya f***ing tw*t! R u an idiot or somethin'? Why dont u read d' news and luk at d' facts before lyin' to me. Ill f***ing murda ya in a fight m8. ... Oh my lord, lol! ^^Had to double check just to make sure "enable word censoring" was still off when I saw those asterisks. While on the Fury 325 brake run, I heard someone say: "Thunder Road's next!" If they're expecting to ride Thunder Road today, they'll be very disappointed. Lesson learnt - gorillas are unintelligible and are afraid of knowledge. Don't even bother trying to educate. ^ One of the most surprising, no... shocking examples of internet lingos IRL! Just a lift hill evacuation. 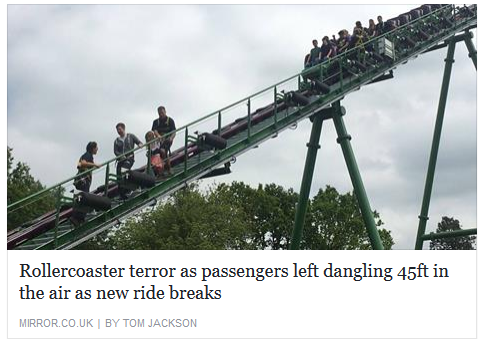 The article said nothing about Final Destination 3 happening in real life. Dangling? But the lift is right side up! ^ ROFL "the articles for the mirror" comment! Rider: Am I gonna die? Rider: I'll sue you if I die. The UK press are keeping some bad article writers in business reporting every breakdown with sensationalist headlines. EDIT: Not talking about you, by the way. Can't we go back to actually dangerous rides that would simply kill these retards? And then just continue operation like nothing happend? they mean Alton Towers, but oh well. Last edited by skyscraper on October 3rd, 2016, 2:05 pm, edited 2 times in total. While playing Pokemon Go at Kentucky Kingdom, one of the Lightning Run Pokestops said 'Lightning Run: Kings Island's newest steel coaster'. There's also a Pokestop for Roadrunner, which isn't there anymore. ^ Kind of crazy lol. There was this very preppy stereotypical white girl in front of me while waiting in line for Gatekeeper. She turned back and said to her friend, "Have you heard this ride goes upside down in loopty loops forty times! That's pretty f*cking dangerous, oh my GOD!" I was pissed off for the rest of my day at Cedar Point because of that idiotic comment. Hmm, she must have thought of another 4D Free Spin stuff! I just made a speech for the GP comments on Youtube. Specifically, on this video. 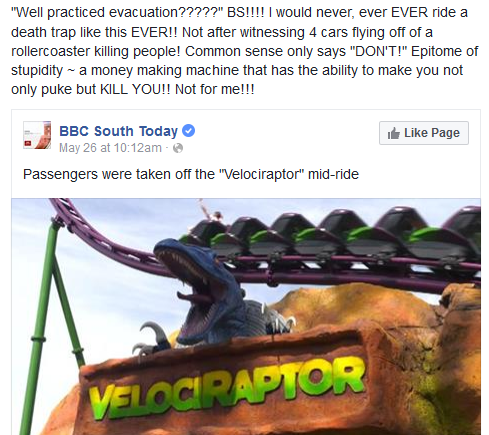 If you are afraid of riding roller coasters because they're dangerous, READ THIS! I've ridden over 100 roller coasters at 24 different parks. I can assure you those things are not death machines as they are known. Plus, all of these accidents were HUMAN ERROR. If ride operators cared about their job (New Texas Giant and Superman) and the general public weren't so stupid about rides (the man who wiggled out of his restraint and the teen who was decapitated), all of this s**t would never happen at amusement parks. PS: Space Journey is not a roller coaster. The only reason why it killed park goers is because of improper maintenance, which is ALSO human error. PPS: The man who held on to the coaster car for dear life was told by a worker to push a cart, which turned out fatal. Again, this is an example of human error. If you b*tch about these deaths and how parks are "unsafe" because of them, grow. a. mother. f**king. PAIR. I have just wasted fifteen minutes of my life attempting to explain everything to you bastards. While some are trying to figure out what the hell I just said, I'm all in on riding El Toro for the thirty-fifth time. YouTube introduces neat coaster videos while they show a lot of "photoshopped" coaster clips! Like this one top 10 roller coaster accidents video that showed Griffin blowing up in the thumbnail, and another one that showed a wildfire next to The Beast. -A majestic speech written by the Lorax, which is for once not about speaking for the trees.